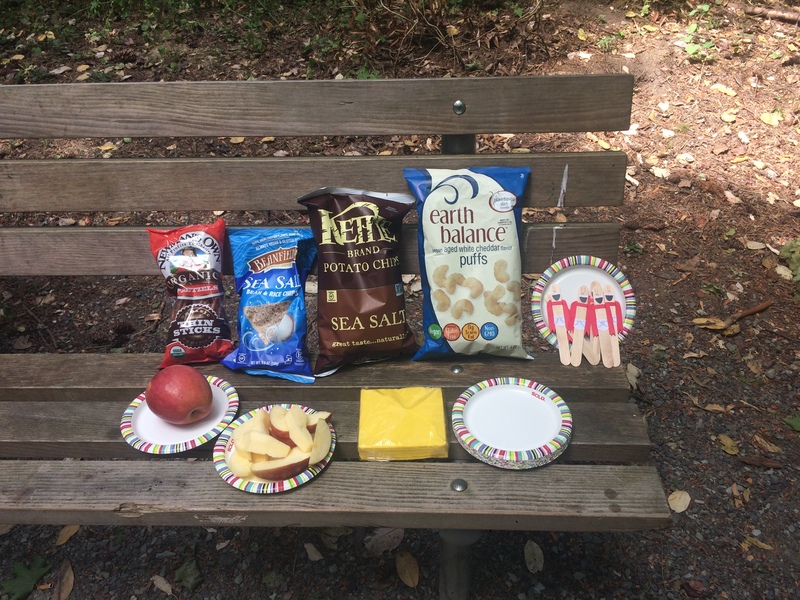 Having kids with birthdays during Spring Break and Summer Break means we haven’t been in town to throw a birthday party for a while–six years sez the blog! 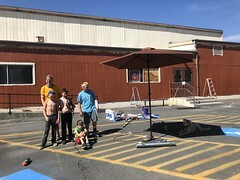 Doing super fun (usually bikey) things on their big days has been terrific, but my freshly minted eight-year old wanted a party in town this year. He decided we’d watch Captain Underpants: The First Epic Movie and have Menchie’s Frozen Yogurt (one of those places with too many apply-your-own toppings and then pay by weight) afterwards. The only place still showing Captain Underpants was the Landmark Crest Cinema up in Shoreline, nine uphill miles from home. The birthday boy wanted to bike the whole way there, but I thought that might be too big a day, even with the closing sugar high so I suggested we bus there with our bikes and bike home. Menchie’s is two miles from the movie theater so we shuttled the party between the two venues by city bus. And we started the party at a park near the theater so they could play a bit and then trek half a mile while the kids and I pushed our bikes. 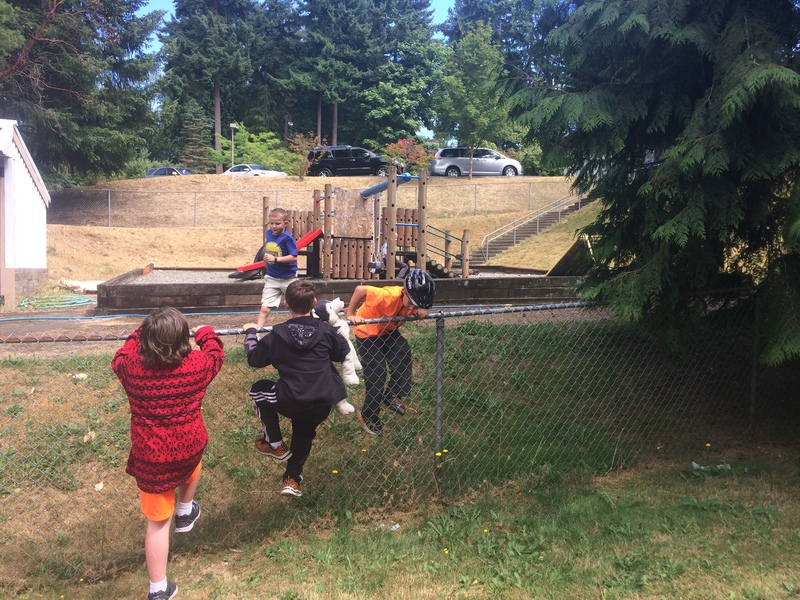 Fun and multi-modal! 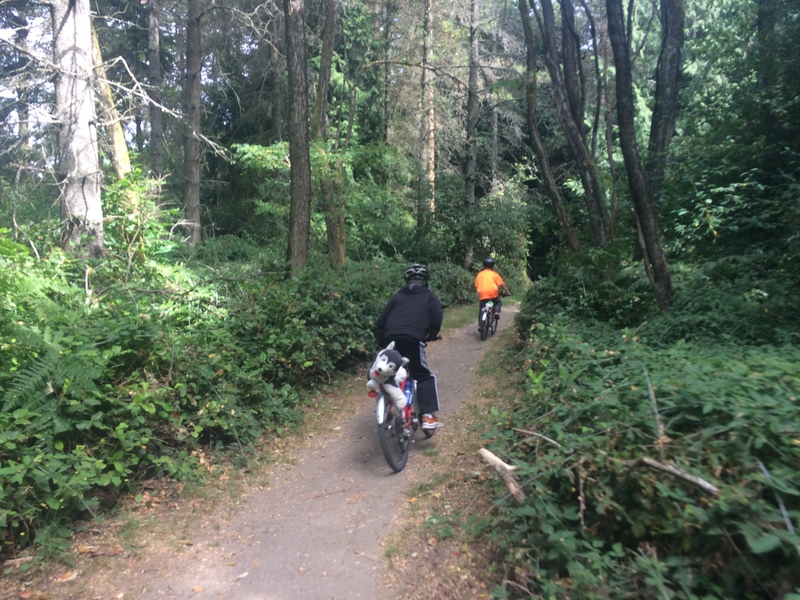 I did most of the carrying (the kids carried stuffed animals on their rear racks) on my road bike. I have a handlebar bag and saddle bag (Swift Industries Paloma and Large Zeitgeist) that hold a lot, but most of the stuff (snacks, cake, candles, party favors) were in my big All-City backpack. One of the mom offered to carry the presents to the end of the party, but we’d eaten enough snacks that they fit in the backpack. 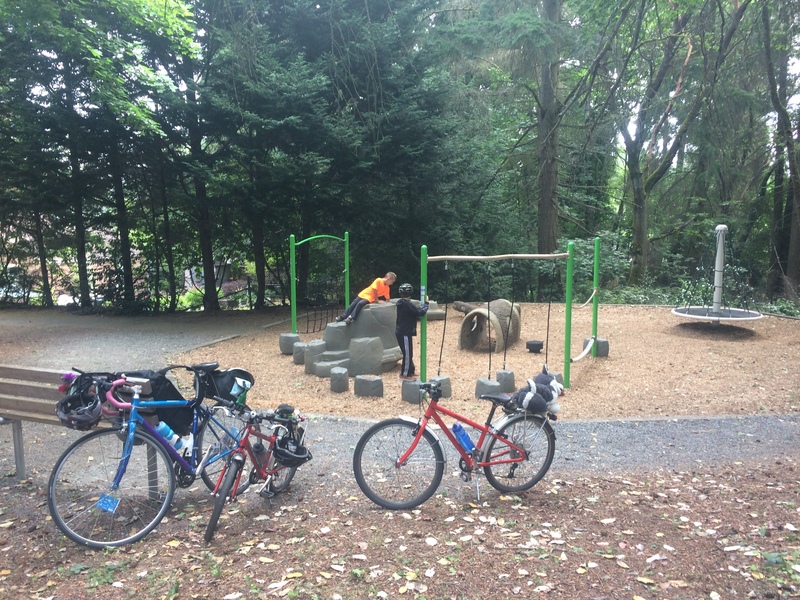 Our starting park was Northcrest Park and it was great! We took two buses to get there and it took about an hour…which is probably quicker than it would have taken us to bike there (Google maps says 59 minutes, but Google maps doesn’t bike with two kids). 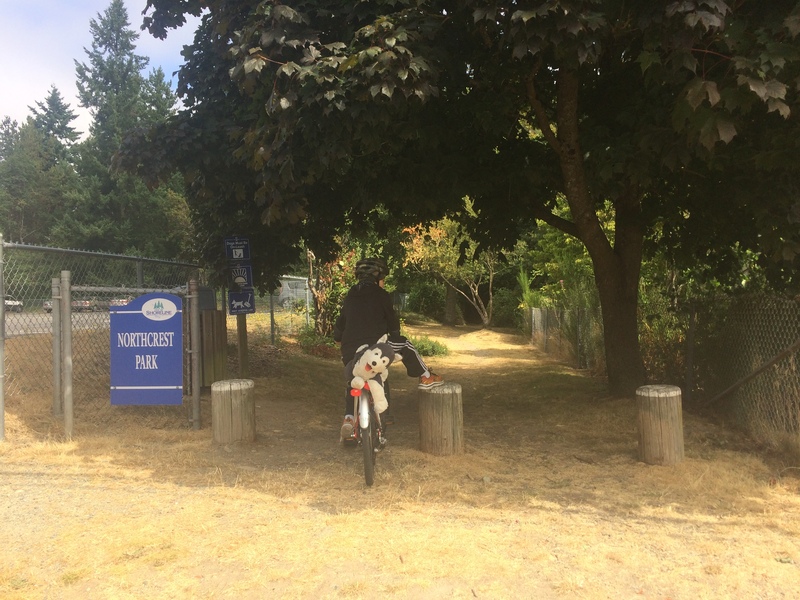 We entered at the south of the park and biked along a great trail a quarter of a mile long to get to the playground at the north end of the park. I hadn’t counted on the six kids tiring of the small-but-fun play structure way before our 45 minutes of snacking and playing was up and they bolted for the trees and all found very big sticks. Eight-year olds have matured beyond the “sticks cannot be longer than your arm” rule I found out. But no one got hurt and I talked one of the kids out of brandishing a log (a log!) and soon enough we hiked south through the park trails and one sidewalk block to the movie theater. The Landmark Crest Cinema shows $4 movies! And has bulk snacks! I got the kids two large popcorns (comes with a free refill!) and initially talked them out of sweet snacks since we’d be having plenty of sugar later, but was overruled halfway through the movie and ducked out to get $8 worth of bulk M&Ms. I thought the movie was pretty great, too. Then we had a bit of a walk to the bus stop, from 165th to 175th. I say the street names because that makes it sound farther than “half a mile.” I lost control of the group again as they spied a preschool playground next to the bus stop. That helped the 15-minute wait go by more easily. Paying for the bus proved a little confusing. I asked our driver on the first bus (when it was just us three) if I could tap five kids on one ORCA youth card (I know you can do this with ORCA adult cards) and he said they were really just for one kid. So I asked what the price for each extra kid was and was told it’s 50 cents. Um, no. I know that’s not the cash price because there’s a great Summer Youth Program giving kids free ORCA cards and charging all youth paying with ORCA only 50 cents. Finally he shared that cash youth are $1.50. Which I really should have looked up, but I was sure we’d be able to tap them all on one card. 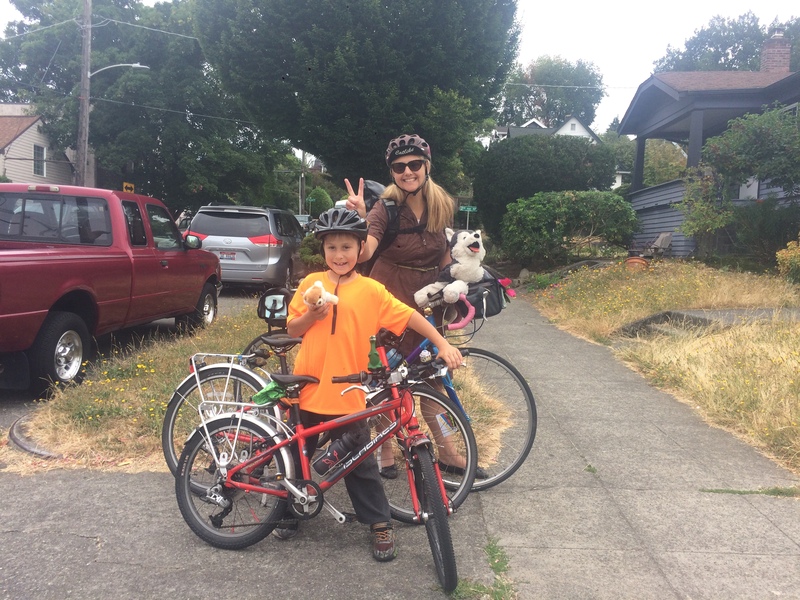 So I gave my oldest our three ORCA cards and $6 to pay for us all while I put the bikes on. Except everyone had to hold something so three someones had ORCA cards, someone had a five dollar bill, someone had a one dollar bill, and someone was sadly empty handed. Probably the birthday boy’s big brother. I wish I had thought to bring six one dollar bills. I forgot how fun it is to feed things into the bus till. 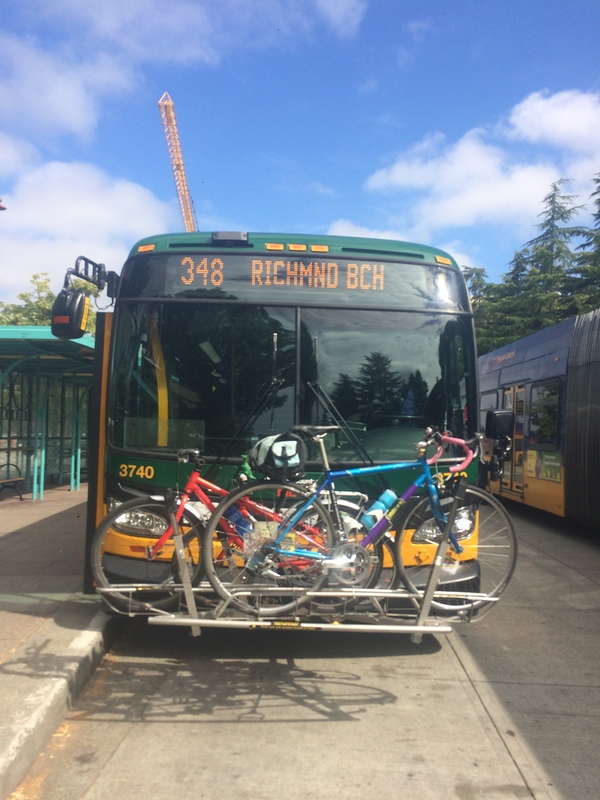 By the time I had racked the bikes and climbed the steps into the bus, I came upon the end of some confusion. I’m not sure what happened, but the driver had the kids keep the cash and I think she tapped them on my adult card. Or maybe she just let them on free? This led to a brief moment of excitement by the two party attendees holding the cash over possibly keeping the bills, but I was able to get them back. The kids were very well behaved for our six-minute bus ride, though the driver stressed I wasn’t allowed to leave any behind on the bus. Heh. And then we just had to cross two busy streets of the Aurora/185th intersection and were at Menchie’s! Everyone’s eyes were bigger than their stomachs, plus we had birthday brownie cut into small pieces to add as an additional topping. Thank goodness for good weather and outside seating because I didn’t think Menchie’s would take kindly to fire and food brought from home in the shop. I gave us an hour of Menchie’s time before the parents were supposed to arrive and again I kicked myself for not planning for a bunch of fresh-out-of-an-action-movie, sugar-fueled active kids. I reined them in to open presents, but the last 20 minutes were spent playing dodge ball with a small dog in a bear suit stuffed animal. Poor Boo (or poor Poo as we was renamed moments after his name tag was removed). And then everyone left and I crammed all the stuff back on my bike. I hadn’t realized this Shoreline Menchie’s is the one right on the Interurban Trail! I think riding from the trail the two miles to the movie theater would have been hilly and unpleasantly busy, but only riding along the trail in the south/downhill direction was awesome. It’s still a longer ride than we usually take and we stopped for a few brief rest/water breaks. 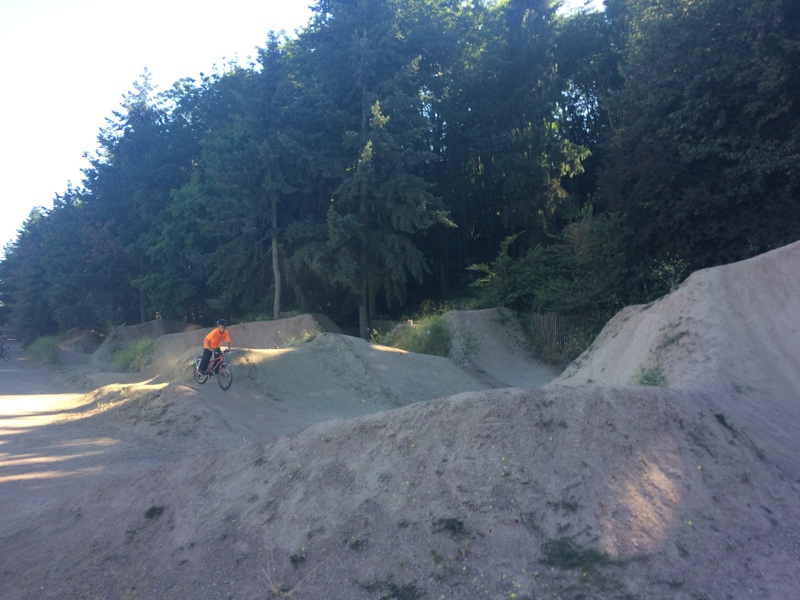 We opted to come over the top of Green Lake on our way home (we usually go south of the lake) and contemplated stopping at the wading pool to get our feet wet, but the kids decided they would rather rush home…that is, until we cruised by the dirt jumps in Lower Woodland Park. And to round out the day with the birthday boy’s favorite meal, we made one last stop on the way home for sushi to go. Happy happy!